Peugeot has often been synonymous with classicism and it has generally eschewed in-your-face designs. This image started to change in the 1980s with the launch of the highly-successful 205 GTi and the company subsequently took a keen interest in racing. Still enjoying the momentum created by the 205 GTi, Peugeot decided to launch a performance-focused variant of the then-upcoming 405. The car was designed as a follow-up to the 505 Turbo Injection and the 305 GTX but this time it wouldn’t be a wolf in sheep’s clothing. The 405 Mi16 was painstakingly designed as a world-class sport sedan and damned if anyone was going to need to look at the badge on the trunk lid to tell it apart from run-of-the-mill 405. The 405 Mi16 was introduced to the press and the public in August of 1987, three months after the regular 405 lineup made its debut. It was powered by a 1.9-liter four-cylinder XU9 engine also used in the 205 GTi (among others) but fitted with a 16-valve head. The engine made 160 horsepower at 6,500 rpms and 130 lb-ft. of torque at 5,000 rpms, enough to send the 405 from zero to 62 mph (100 km/h) in 8.6 seconds. Power was transferred to the front wheels via a five-speed manual transmission. Even in the late 1980s PSA Peugeot-Citroën was worried about economies of scale so the 16-valve variant of the engine was also installed under the hood of the Citroën BX GTi 16 Soupapes and, later, in the Peugeot 309 GTI-16’s engine bay. Disc brakes on all four corners, power steering and and an upgraded suspension helped keep drivers exploit the engine’s full potential. Designers did a remarkable job at blending performance genes with Peugeot’s trademark classicism and while there was no mistaking the Mi16 for a regular 405, it didn’t scream power at the top of its lungs, either. It featured beefier bumpers on both ends, side skirts, fog lights up front and a spoiler mounted on the trunk lid. Mi16-specific cladding on the doors and five-spoke alloy wheels wrapped up the performance-focused look. The changes were less noticeable on the inside and largely limited to a bespoke instrument cluster, a three-spoke sport steering wheel and bucket seats for the front passengers. Although it was relatively expensive compared to a standard 405, the Mi16 was popular with its target audience and it was even briefly offered in the United States as a last-ditch attempt to steal sales from the Germans and outlive the Italians. 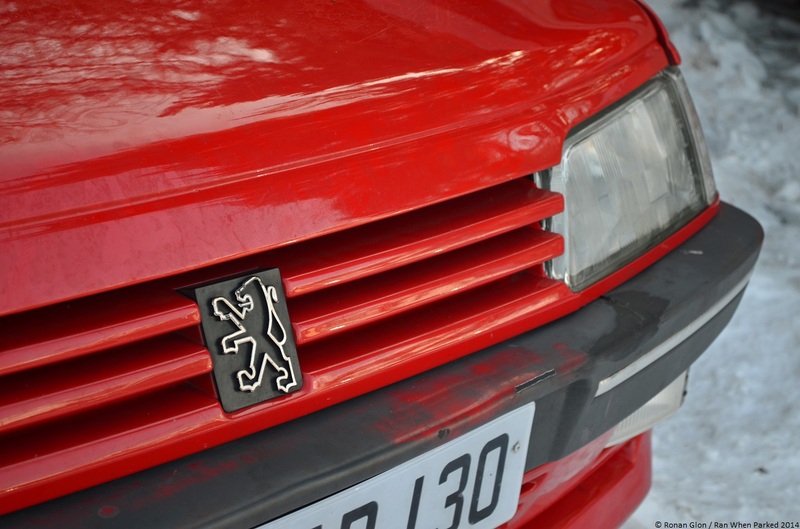 The car was too little, too late to save Peugeot and the brand disappeared altogether in 1991. Back on the Old Continent, hot hatches were declining in popularity but sport sedans clinged on to their historically small market share and buyers in the market for a sporty 405 could also look at a host of other models from Ford, Audi and Alfa Romeo. Generally speaking, rival models were either considerably less powerful or more expensive than the 405. Renault took the most direct shot to date at the 405 in 1988 with the 175-horsepower 21 Turbo. It was no surprise that the 405’s closest rival came from Peugeot’s arch enemy and execs stepped up the game a year later with an all-wheel drive variant of the Mi16. Christened Mi16X4, it was powered by the same 160-horsepower engine as the front-wheel drive Mi16 but 53-percent of the power was sent to the front wheels and 47-percent was transferred to the rear axle by an all-wheel drive system equipped with a Torsen rear differential. The weight added by the all-wheel drive drivetrain bumped the Mi16X4’s 0 – 62 mph time to 9.4 seconds. Interestingly, the Mi16X4 was equipped with a self-leveling rear suspension that was similar to the one found in the Citroën BX. In early 1992, the 405Mi16 cost 155,250 francs and selecting all-wheel drive increased the car’s price to 181,300 francs. The 21 Turbo retailed for 173,000 francs with front-wheel drive and 199,3200 francs with all-wheel drive. 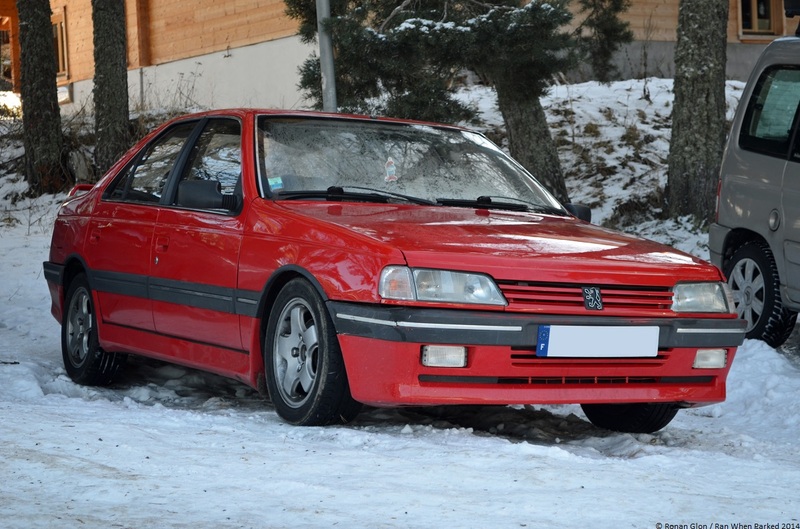 The BX GTi 16 Soupapes stickered for 139,500 francs and a base-model 405 powered by a 1.4-liter engine started at 77,600 francs. Peugeot introduced a host of new engines to the 405 lineup in July of 1992 in order to comply with strict emissions norms that came into effect across Europe in 1993. For the Mi16, the norms meant the 1.9-liter’s displacement was increased to 2.0-liters and equipped with a mandatory catalytic converter. The engine made 150 horsepower and 135 lb-ft. of torque, robbing the Mi16 of its high-end punch. The Mi16X4 was phased out at about the same time, leaving the front-wheel drive model as the only torch bearer of Peugeot’s dwindling sporting ambitions. 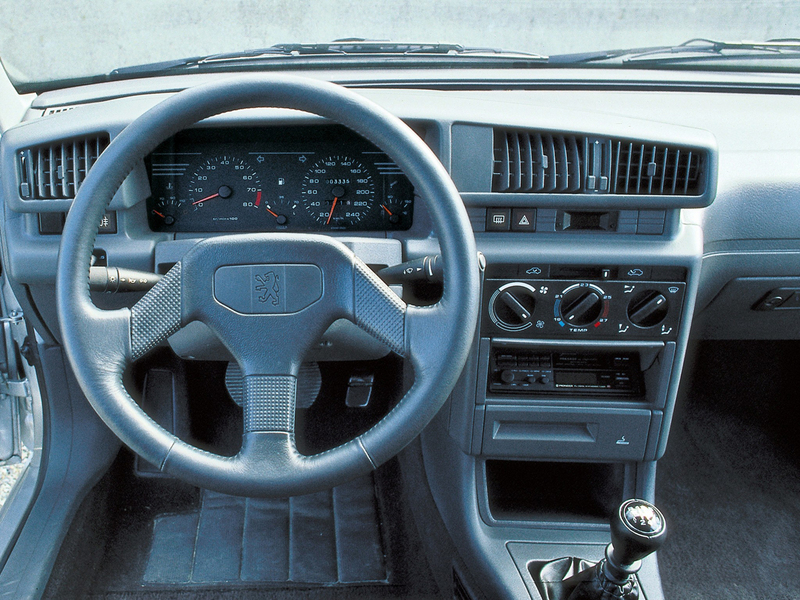 Negative feedback from would-be buyers prompted Peugeot to launch a new range-topping model dubbed T16 in 1993. It was equipped with a modified version of the 2.0-liter found in the Mi16 that was fed by a Garett turbocharger. As a result, the mill made 220 horsepower and 232 lb-ft. of torque, enabling the 405 to reach 62 mph (100 km/h) from a stop in a very respectable 6.5 seconds. Power was sent to all four wheels via a five-speed manual transmission. The 405 T16 was well-received but it is a different story for a different time. All versions of the 405 including the Mi16 and the T16 were phased out from the Peugeot catalog in late 1995 to make room for the 406. The 406 was offered with a 194-horsepower V6 developed jointly by PSA and Renault but a true sport sedan was never offered and the Mi16 died without a heir. Big fan of the 21 Turbo Quadra. Wrote a big article about it (and the Safrane BiTurbo) a number of years ago. I’ll see what I can find on the T16. The Turbo Quadra is great, it’s becoming harder and harder to find. Like most performance sedans and hatchbacks from that era they lost nearly all their value over the course of the 1990s and wound up in the hands of tuners. You can imagine the rest of the story – hint, it involves body kits and primer. Hi. The 405 standard versions will take a little while yet to be declared a ‘classic’, if ever. Especially as they are, after 30 years, still being built. However the Mi16’s, are now, in 2016, most definitely in ‘classic’ territory. Especially the Phase 2 as it was not available to the North American continent. So we lucky few who own top examples of this beautifully Italian (Pininfarina) styled and brilliantly engineered 1.9 and 2.0lt 16V engine car, will hopefully continue to be responsible and dedicated custodians of these, now, very rare ‘classics’. Mal. Ps. For an example of a fully wound up T16 engine, view “Sky Dance” with Ari Virtanen at the wheel. MAGIC sound. Don’t worry about the body work, as it was a hand built one off special for the Pikes Peak run.